Some Older “Ultra-cranes” Are Migrating! Martha’s Mystery Photo: Is This a Whooper, or Not? Where are North America’s tallest birds? Ask the Expert Opens Today! Crane "decoys" show young cranes to roost in water. The "costumes" also teach the young birds this important lesson. Sad news: the remains of crane #405 were found on the bank of E-Creek, 200 meters south of the Chassahowitzka pen on March 14. He was apparently killed by a bobcat during the night before. How did this happen? The crane kids have developed a bad habit of roosting at E-Creek. This has been their main roost site since release from their top-netted pen several weeks ago. The E-Creek area offers safe roosting habitat only at low or extremely high water levels. The chicks have been leaving the pen area as darkness falls to roost at this site. The area between the pen and E-Creek is covered with such thick needlerush that the costumed caretaker cannot walk the birds out. The needlerush plus water conditions, darkness, and poor following behavior make it impossible for costumed caretakers to retrieve juveniles roosting in this area so they can be led to safe roosting in their pen. That’s how the bobcats scored again. What would YOU do? 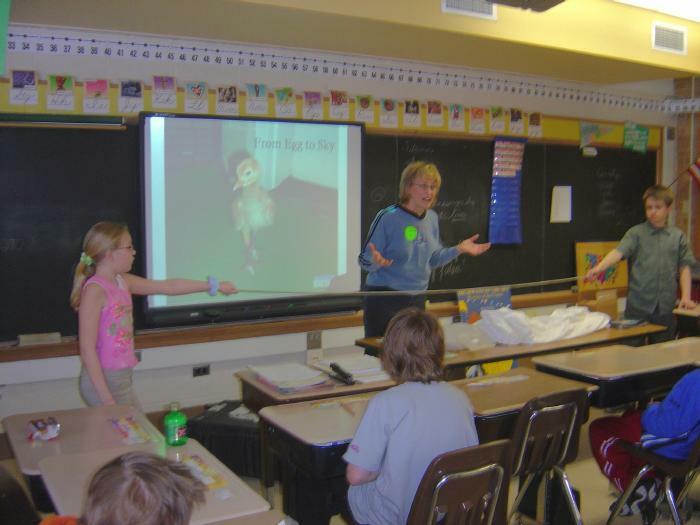 As the writer of the Journey North crane reports, Jane Duden was invited to visit Ms. Paulus’s 4th grade classroom in Deephaven, MN. Connor got to wear the white costume and puppet used by the ultralight pilots and crane caretakers. Everyone liked the plastic crane leg and legband with radio transmitter and aerial. And Jane was interested in the names the students came up with for the cranes they will track this spring! 420 Pequeno--means small in Spanish; she's the littlest of all. 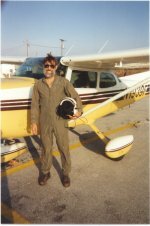 The scientists and pilots know each Eastern flock bird by the unique color code on its leg band. They know every single chick’s hatch date and which male and female crane created the egg it hatched from. The scientists even say the birds’ personalities often remind them of people they know! But they never give the birds a name. Why do you think the scientists don’t name the birds? At the big crane gathering stopover on Nebraska’s Platte River, Martha Tacha reports no confirmed whooping crane sightings from the western flock, but she expects some soon as they leave Texas. Martha says, “There are a few partially albino sandhill cranes in the flyway that keep things interesting. At least one of these, maybe two, are in the Platte River valley. 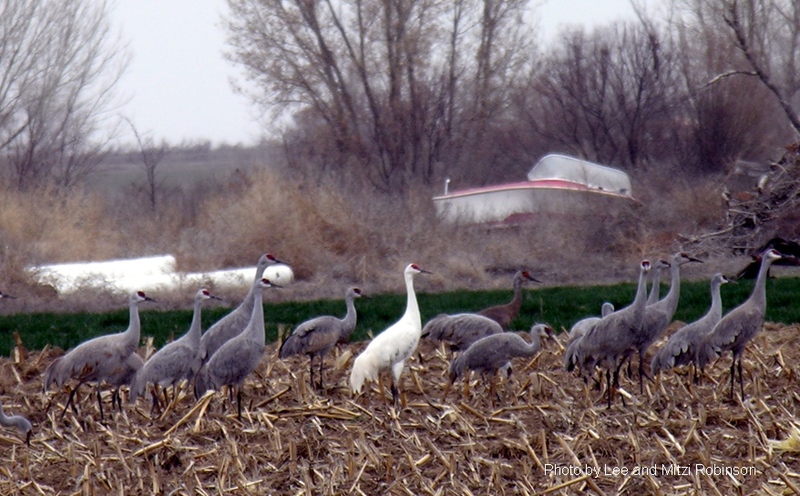 So, we have been spending some time trying to confirm these as sandhill cranes and not whoopers.” Martha sent this photo of a partial albino sandhill crane that was seen in extreme eastern Colorado on March 14th. You can see why observers would have to look twice at this sight! Sandhill cranes, including one albino crane. Do you see it? Crane ID: Will You Know a Whooper? Crane #208 with PTT on his right leg and radio transmitter on the left leg (red/white). 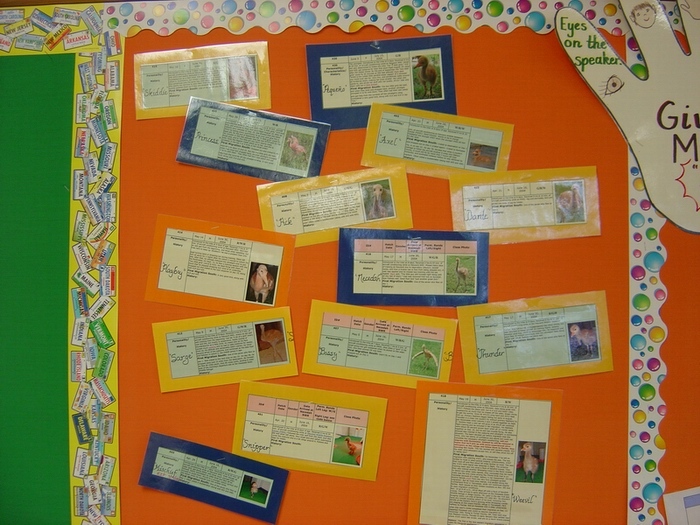 Thanks to ALL the students who studied the crane biographies and sent their choices for PTTs! You showed some great thinking. You considered things such as fast learners, leaders who want to be in charge, good flyers, birds that do well when left alone, birds that are stubborn or independent, or birds that especially need to be watched. Thanks to all the Iselin Middle School 7th graders who spent time and effort to answer this question. They are: Roopsi, Brittany, Patrick, Rodney, Melody, Sahaib, Teona, Bryan, Joe, Kurt, Priscilla, Navdeep, and Tapan. Special kudos to Monica, Sirena, Kristen, and Brianna. 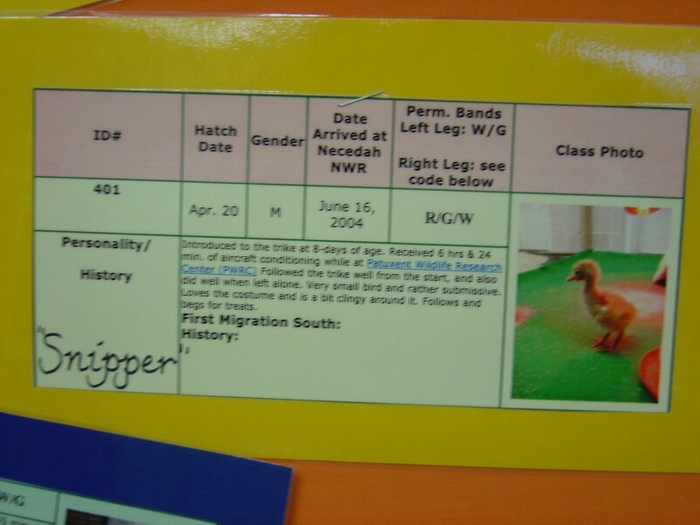 They picked #418, who did not migrate with his ultalight flock mates and explained why: Last fall he was instead “released in hopes that he'll join up with some experienced ultra-whoopers on the refuge and follow them, thus learning the route. However, the ultra-whoopers might drive him off or battle him, and his position needs to be known so he doesn't get lost.” Well done! United States Whooping Crane Coordinator Tom Stehn gave us the latest whooping crane population figures. See where the world’s whoopers are. How many are in each location? 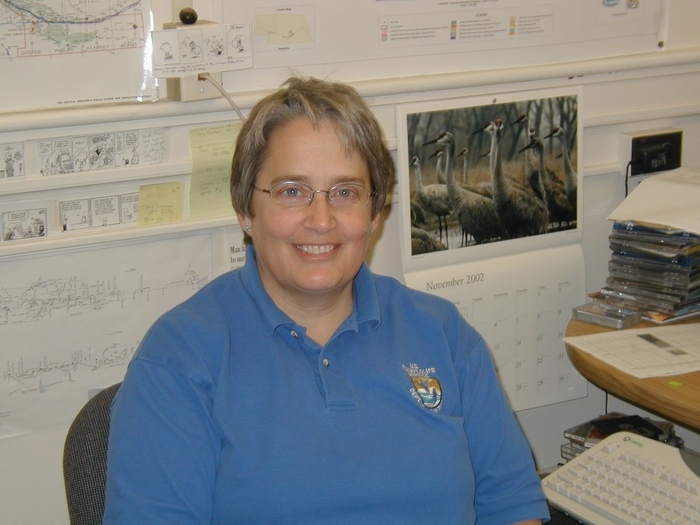 Once again this year, ornithologist Laura Erickson will respond to students' questions. We are thrilled to offer you this opportunity! Your questions will be accepted from 1 pm March 25 to April 8. Ready? 2. In the Subject Line of your message write: Challenge Question #3 (OR #4). 3. In the body of EACH message, give your answer to ONE of the questions above. 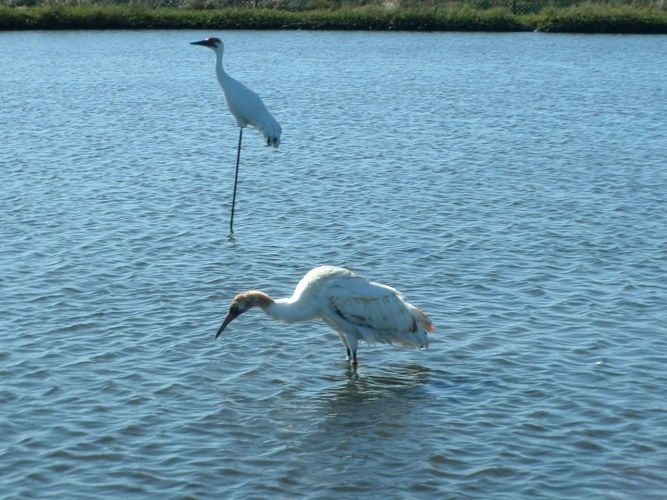 The Next Crane Migration Update Will Be Posted on April 1, 2005. Copyright 1996-2005 Journey North. All Rights Reserved.